“Win-now” mode is, of course, a nickname for the strategy of using any and all means to assemble the best possible team in a given year, even at the expense of future competitiveness. This strategy used to be reserved for an aging team looking to win a championship before losing key pieces to retirement, but now it is implemented as soon as a team finds a promising young quarterback because rookie contracts are a small fraction of a proven veteran’s compensation. The goal is to win a championship before a QB earns his big payday. It is difficult to argue with this logic, especially after comparing all 32 rosters. Currently, Dak Prescott and Derek Carr are rated as the top two most valuable quarterbacks in the NFL this season by Spotrac, a site that tracks salaries for every team across the four major American sports. Spotrac’s value rating essentially takes the difference between an individual player’s statistics and the average statistics at their position and weighs it against the difference between that same individual’s contract and the average contract at their position. These value rankings signify that, statistically speaking, Prescott and Carr have played well above the average NFL QB level in 2016 AND that they are doing so at a cost far below the average NFL QB salary in 2016. Noticeably missing from the top ten of Spotrac’s 2016 QB value rankings are the success stories of the first half of the 2010s: Andrew Luck, Cam Newton and Russell Wilson. All three are proven to have championship-level talent, and they were all paid accordingly. On one hand, those contracts will likely ensure that the Colts, Panthers and Seahawks will remain relevant for the next few years, but on the other hand, it is clear that the cost of those contracts is forcing all of those teams through growing pains. Colts GM Ryan Grigson has publicly blamed Luck’s contract for the team’s lack of talent on defense, which definitely sounds as if he misunderstands the point of his job. The challenge for a modern NFL GM is to not only find a franchise quarterback and then sign them to a long term deal, but also to maximize the talent everywhere else on the football field with however much money remains. It is not a secret why the Colts are now likely to miss the playoffs for a second year in a row; they are one of four teams to be in top ten for points allowed in both 2015 and 2016, Andrew Luck is perennially hit and sacked more than almost any other NFL QB and he now has the injury history to prove it. These results are the repercussions of “Win-now” mode. Soon enough, this will be a problem for Oakland and Dallas as well, and how they adjust to a tighter cap situation will likely decide just how successful their promising QBs can be. The high level play of Prescott and Carr this season is, of course, largely due to the pieces surrounding them. Dallas and Oakland had the first and third ranked offensive lines, respectively, heading into Week 11 per Pro Football Focus. Through Week 14, these two teams both have top 5 offenses by Football Outsiders’ DVOA measure, which adjusts for the quality of opponents. Unfortunately, the only direction either team can go on offense seems to be down. Prescott’s emergence could represent quite the boon for Dallas, who can move on from Tony Romo’s large salary and restock their talent on both sides of the ball. There is probably no bigger fan of “win-now mode” than Jerry Jones, so fans can expect the Cowboy’s extra cap room to be spent immediately and lavishly. Meanwhile, the Raiders have one more year of a cheap Carr, after which they will have to make room to lock up Amari Cooper and Khali Mack, who are also on rookie contracts. How Oakland plans to restock their stellar offensive line, or improve their defense, after paying those three is anyone’s guess, but they likely will depend on draft picks. Still, the idea that these two teams have to win the Super Bowl while their quarterbacks are in their early 20s seems backwards given how highly professional teams also value playoff experience. Neither QB has played in an NFL playoff game yet, let alone won one. 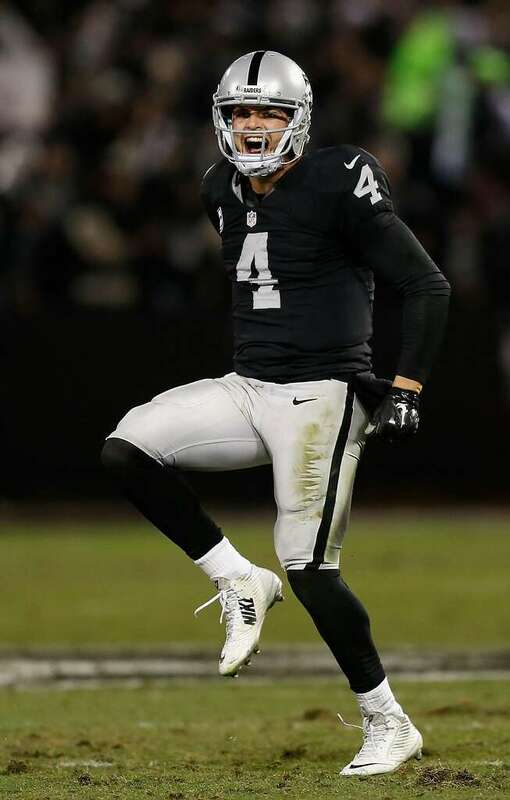 Prescott and Carr are the two biggest young quarterback success stories of the 2016 season, and both were even generating MVP buzz up until they each lost to division rivals on the road in Week 13, but they are about to face the toughest competition in football for the first time. Expecting them to lead their teams to a championship ASAP seems presumptuous at best. These problems are what the NFL wants. If quarterbacks are more expensive during what should be the prime of their careers, then the salary cap effectively levels the playing field and increases parity. This is clearly not a completely negative development for the league. If the salary cap was structured differently, it would not be difficult to imagine Aaron Rodgers and Tom Brady meeting in the Super Bowl at least every other year. Conversely, placing the onus of championship expectations on quarterbacks who have only recently adjusted to the speed and sophistication of NFL defensive schemes seems like foolish short term thinking. There should be more options than burning out or fading away. Of course, the term “lose-now” mode does not exist; but make no mistake, it is called tanking and it is the equally frustrating opposite problem. The other three teams are the Saints, Jaguars, and Browns. An ironic twist considering his biggest success to date was the Herschel Walker trade. Media narratives are cruel and fickle beasts. I will never understand why other teams with expensive QBs can’t copy New England’s creative accounting techniques. He’s high on the spotrac value ranking every year, to no one’s surprise, but I guess no one else has the Ugg money / Gisele money. The new economy is all about alternative income streams.